By chance Ursula Menzel came in contact with brass instruments, but then quickly sought formal training. In the late 1950s she gained some experience in this field while assisting in a brass instrument workshop in Hamburg. There, she realized that music and the crafts could be combined perfectly in this profession. Born in Prague and raised in Munich, Ursula Menzel spent her last school years in Hamburg, where she then started her training as a brass instrument maker. After receiving her diploma, she went on a cruise to Argentina, visiting relatives. The planned four-week trip turned into a two-year adventure, during which Ursula Menzel discovered a love for the country and the language which she kept for a lifetime. After returning to Bavaria, she took a position as a high-ranking secretary in an electronics company. 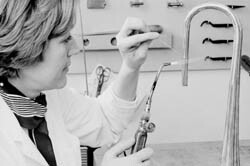 From 1972 until 1976 she worked in the restoration department at the Deutsches Museum in Munich, where she found the inspiration which lead to all her future activities. "This opened my eyes to the miracle of musical instruments." Here she came into contact with musicologists, art historians and scientists, worked on catalogs and check lists, and met Fritz Thomas, who was then head of the restoration department. She worked alongside him, and developed a life-long friendship. During this period she dreamt of opening her own private restoration workshop. However, to be able to do so in Germany, she had first to acquire a master's diploma for brass instrument making, which she gained in 1978. Her master-piece, a Wagner tuba, was honored with the gold medal for best work of the year, and she received the medal from Franz Josef Strauß, who was then the premier of Bavaria. This Wagner tuba is now in the musical instrument collection at the Deutsches Museum in Munich. 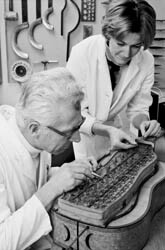 In 1984 she opened her restoration workshop in the heart of Munich, under the arcades of the Münchner Stadtmuseum; here she restored 544 musical instruments from 76 museums and private collections worldwide, carefully documenting her work. In 2001 Ursula Menzel donated her entire set of documents on brass instruments, drums and kettle drums to the Deutsches Museum; this material is now accessible to anyone interested. Ursula Menzel was a renowned musical instrument maker and restorer, who worked intensively on her projects, always in search of the essence of the problem. Every answer to a question triggered five new questions. She shared her knowledge and experience generously in publications, in which she succeeded in defining her ideas clearly. Ursula Menzel died on November 10, 2006 in Munich. Ursula Menzel and Fritz Thomas working on a mélophone by Leclerc & Brown, Paris c. 1840. Thanks to Michael Münkwitz, Sabine Hoffmann, Silke Berdux, Fritz Thomas and Marianne and Thomas Menzel for information presented here.